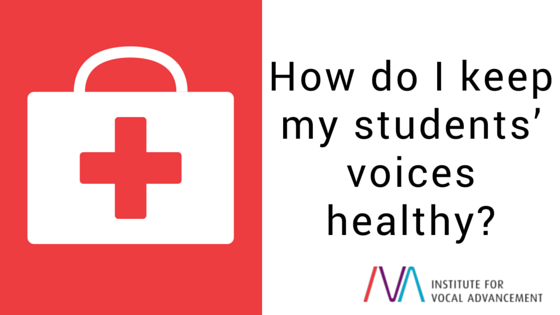 How do I keep my students' voices healthy? You are here:Home Hints and Tips How do I keep my students’ voices healthy? As teachers of singing, we want to help our students develop their voices and improve their technique. Our goals include training students to sing smoothly and naturally, and along with that instruction comes the importance of teaching them to pair vocal quality with vocal health. Providing great vocal training must include helping students practice good, vocal health so as to prevent fatigue, damage, or injury from occurring. We can accomplish this by teaching students how and where to cross their passages, how to mix, and how to produce a good balance between airflow and intrinsic muscular resistance. Then, of course, we must encourage them to practice often so that this healthy balance can become second nature for them. It’s important to remember that this advice applies to teachers of singing just as much as it applies to our students voices. Educate your students about how delicate the voice is and what can affect its health. Singers need to be better educated about how to take care of themselves so they can notice early on when any problem is developing. According to top vocal doctors, the first warning sign of vocal health issues for a singer usually involves him or her noticing that their voice does not recover as quickly after a performance as it once did. If you or your student notices huskiness lasting for a period longer than a few weeks, it is crucial for that singer to get their voice checked out by a medical professional. The most common medical problems that can develop include benign polyps, cysts, granulomas, and nodules, which are all growths akin to calluses that develop on the vocal folds, often caused by repeated irritation. Doctors now have much better diagnostic tools in which to see what is happening, so it is always a good idea to visit a laryngologist as soon as you suspect anything is wrong. The strain of singing hard, night after night, can take a big toll on the vocal folds. There is no doubt that professional rock and pop singers on extended tours run a substantial risk of damaging their voices, along with singers in musical theater productions who are asked by their directors to push their voices. before, as well as after, the show, which can really tire out the voice. Vocal folds need time to recover after a rigorous performance. Keeping our voices free from medical issues and giving them enough rest time are critical elements for promoting vocal health, but we must also warn our students about the dangers of substances that can dry out or damage vocal folds. These substances include, but are not limited to, alcohol, coffee, and tobacco. Smoking and any smoke substances will cause drying of the vocal folds and thus limit a singer’s range. General health is important for a singer: eating right, exercising, drinking lots of water well in advance of singing, getting enough sleep—all of these healthy life habits can affect the voice and a singer’s overall energy level and stamina. A student should never compromise the health of his/her voice because their desire to perform outweighs the need to rest and protect their instrument. We must help our students understand and honor the importance of taking care of their voices. We must encourage them to nurture healthy habits for the benefit of not only their voices, but also for the bettering of their lives overall. Just a point about water, the recommendation is that many cups worth per day, not actual cups of water. Many fruits for example contain lots of water and count towards this total. Don’t try and force yourself to drink that much water.